Every year I grieve a bit as Summer comes to a close. I grieve the end of months spent wading in creeks and swimming in pools. I grieve the end of afternoons spent sitting on curbs eating drippy ice cream cones and the end of leisurely mornings making waffles. I grieve the passing of time and the passing of childhood. 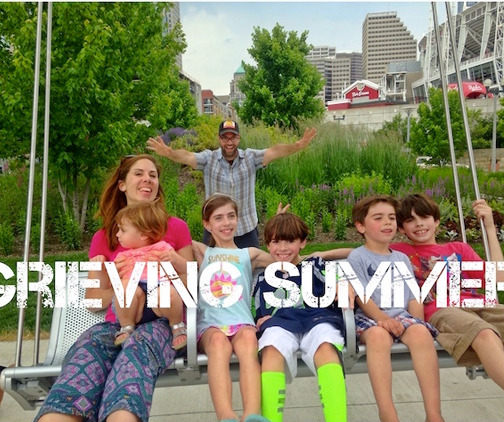 I grieve them being a little taller and a little wiser and I grieve that we will once again rush out the door each morning and wrestle each night to juggle homework and dinner, activities and bedtime routines. With the passing of each Season, I am ever aware of how fleeting these days are with these little people in this house. Feet that were once tiny enough to fit in the palm of my hand now nearly fit inside my shoes. Hands that eagerly reached for mine, now pull away when I reach for theirs. Chubby cheeks have become thin and speckled with the signs of change. Hair bows and fancy dresses have been tossed aside for lip gloss and painted fingernails. With each passing season, I grieve. I grieve what has passed and what is still to come. I grieve with force and experience, knowing that each one of these messy, busy, perfectly imperfect days, are a gift. She was 46 that day. I watched through the sliding glass doors as she sat with my father on our patio with a tired, worried look written on her face. She was young and beautiful and right in the middle of raising me. She had swim meets to go to and a school year to finish. She was looking forward to lazy Summer evenings catching lightening bugs and Symphony picnics. And then there was cancer. That Summer we sat together in hospital waiting rooms and treatment clinics. That Summer I forgot that I liked to swim as she forgot to eat and sleep. That Summer, rather than spending our moments finding books at the library and making blueberry muffins, she went to a place where she was reminded to sleep and eat. That Summer they found a place for me too, a place that reminded me that Summer was for picking strawberries and spending lazy afternoons doing cannonballs and for a few brief moments I forgot to worry that my mother might die. This Summer, I watched as my children did cannonballs and caught lightening bugs. I watched as they spent lazy afternoons in piles of Legos and on our tire swing. We waded in creeks and splashed in puddles. We watched fireworks and set off smoke bombs. We ate ice cream and went on picnics. And as we went and did and rested and ran and laughed and fought and wrestled and swam, I was morbidly aware that this Summer might be our last. Yet, I struggle to live right here and now. To put down my phone. To tune out the noise. To soak up the moments. I get exasperated about piles of clothes and shoes and mess and fret about laundry to fold and dishes to wash, when today might be our last. So I purpose to live these moments with purpose. To give more hugs. To tell them I love them. To memorize the curves and lines of their faces and the sound of their laughter. To let go of perfect and embrace mess. To live each moment as if it was our last. This is so beautiful, Heather. I too struggle with being in the moment of summer and children and chaos and all that our children and our responsibilities bring. The scripture verse you shared is the one I will meditate on this week. Thank you! Thank you for your encouragement! I’m glad the scripture resonated with you. I’ll be praying that God would help us both be in the moment this week.